Rudeness at work is rampant, and becoming increasingly more common in our day-to-day. There’s also been a heck of a lot of chatter recently about the concepts of “civility” and “tone” as it relates to “leadership”. Leaders set the tone for the organization, and it’s important that you remain aware of your actions and how you could come across to others. I’ve found that the best results come from consistently showing your team how much you appreciate their creativity, dedication, and sacrifice (aka time away from home). And, when your team feels that you genuinely care about them, 9 times out of 10, they will go above-and-beyond their job description to make sure deadlines are met, and quality work was put in. So… leadership is good, right? Not if someone with great leadership skills is leading you right off the cliff. Avoid becoming “the boss from hell” by managing yourself, modeling your behavior, asking for team feedback, and teaching civility. It can take constant vigilance to keep the workplace civil; otherwise, rudeness tends to creep into everyday interactions, like a cancer spreading throughout an organization. I can help you avoid that. You see, even through my meditation and with my eyes closed, I could feel the eyes, and hear the gasped breathing from my co-workers as they waited for my reaction with anticipation. Would I go nuts and lower myself to his level; insulting direct reports, belittling their efforts or blaming them for things over which they had no control? Or would I take the high road? I remained calm, cool. And, with a slow and lowered tone, responded with “as soon as I am finished with this, I will come see you”, to which I got up from my desk and walked away so I too, could calm down. The conclusion of my story is that even though the bullying went on, (less than before the incident), unfortunately, it was still tolerated by our director. Unchecked rudeness is surprisingly common, but in this case, I simply couldn’t let him think I would tolerate his behavior for another second. Even though I’d flexed my strength in hopes that would stop his BS all-together, I couldn’t protect everyone. It got bad enough that staff learned to deal with him by making up a code for alerting one another via IM (instant messenger) to his impending arrival (“The eagle has landed!”). The only positive aspect was that our shared dislike helped us forge close bonds amongst one another. After the campaign was over, our team formed a network that still thrives to this day. While we can try and control our own behavior or reactions, I think it’s important to discuss how these calls for civility, and how our conversations about tone come about, and how we ultimately decide to apply them. Here’s the good news: you always have the right, and really you owe it to yourself, to self-advocate. Insisting on a fair and even tone, on civil discourse, is a part of that. Controlling the way you speak about things, the way you expect others to speak about things to you and around you, can be your armor. But when we focus too much on tone and civility over substance, then that becomes your crutch, because you miss the forest for the trees. What am I talking about? Well, here’s what I think is healthy: setting boundaries about how others speak to you, and making an effort yourself to speak similarly, so that the actual message, the actual substance is delivered in a way that makes it most likely to be received and processed with positivity and acceptance. Think of an authority figure in your life that you responded well to, and another that you didn’t respond well to. What was it that made you comply with the first, and bristle against the latter? I’d wager that at least part of it was the different ways those two individuals addressed you. Similarly, as a manager, a parent, a customer, or in any other of your daily roles, do you notice when people respond positively to you? I have a hunch it happens when you take the time to address them with understanding and respect. Like the old saying goes, you’ll catch more flies with honey than with vinegar. So, it’s just common sense for me to suggest that you use honey whenever you can, not only because it is likely to get you more positive results, but also because it makes the world a nicer place. Also, I want you to expect honey from others, and no longer tolerate vinegar. Ok, so what’s the problem? That all seems pretty straightforward and uncontroversial, right? Well, two things. First, you won’t always get vinegar from others. Sometimes, that’s because the other person is actually still treating you civilly, but maybe not with the warmth that you might find ideal or desire. It is important to separate what you might prefer in an ideal world with what is a reasonable expectation. Other times, the other person might well be acting unreasonably, in a petty and vindictive manner even, and – fair or not – if you focus on their tone, on their civility (or lack thereof), you could easily get bogged down and miss the larger goals. These kinds of situations, like office bullying, are always a balancing act where you might have to decide what’s worth moving past and what’s worth sticking up for. I can’t make that decision for you nor will I judge you for what decisions you make, but there is always a risk, if not a cost, and you have to decide what you can live with. The other problem occurs when we ignore the fact that conversations about civility and tone are often really conversations about power structure and status quo. On a superficial level, focusing on, for example, swear words instead of the substantive message is myopic at best. Say your manager gets upset and says, “What the f**k were you thinking? We have to fix this now! What are we going to do next?” If you focus on the f-bomb instead of next steps, you’re missing the bigger picture. Maybe, at a later date, it’s worth bringing up with your manager that you don’t respond well to that kind of language. Or maybe it’s one of the many things you might have to tolerate in your manager, especially if it’s just a quirk and not a symptom of a larger pattern of bullying or punitive behavior. On a deeper level, what’s often called “tone policy” is an ad hominem attack (and logical fallacy, for those of you who remember debate club) that is frequently used particularly toward women to reinforce existing power imbalances, including in the workplace. How often have you heard (or said) things like, “Calm down and let’s discuss this like adults,” or “Don’t get so emotional.”? Phrases like these may seem benign, but what they really do is focus on the other person’s emotion rather than their message, and they also infantilize the other person and make them seem unreasonable, giving the speaker of these “tone policing” phrases the immediate upper hand in the ensuing discussion. Tone policing works by derailing a discussion by focusing on and critiquing the emotionality of the message rather than the message itself. And again, it may very well be that in an ideal world, that message would indeed have been delivered differently in order for it to be received with more acceptance. But we don’t live in an ideal world; we live in this one, and it is often incumbent upon us to find the best outcome in less-than-ideal circumstances. Sometimes that even means making up for the other person’s shortcomings, just as we hope sometimes others might make up for ours. Tone policing hinges on the fallacy that reason and emotion cannot coexist, and that one necessarily comes at the expense of the other. Sometimes the emotions are actually central to the topic being discussed. Feelings of anger, alienation, fear, etc., might be exactly what the speaker is trying to address. For example, how ridiculous would it be if an employee approached his or her manager in an attempt to discuss feeling excluded, marginalized, and/or belittled by the rest of the group, up to and including the manager him/herself, and instead of acknowledging the employee’s concern, the manager focused on whether or not the employee was being too “emotional” about the situation? In my hypothetical situation, that would hold true whether you are the employee or the manager. Additionally, some topics don’t have equal sides, so they can’t and shouldn’t be “debated” civilly because that gives undeserved legitimacy to the invalid viewpoint. Sometimes that dreaded “emotion” is absolutely justified and is important to display. All this comes with caveats, of course. There’s a big difference between adult anger as part of a controlled discussion and unhinged anger more akin to a child’s temper tantrum. That’s when tone is your crutch. Whether you serve as the employee or the manager, in my hypothetical HR scenario; if you focus excessively on tone, on worrying whether you will seem unhinged even if you’re only legitimately and proportionately upset, or on other aspects of tone, then you will lose sight of the larger issue, which is that there is a serious problem with team cohesion, communication, and respect that needs to be addressed. So, here’s what I’d like us to try: the next time you are in a scenario where you feel someone is speaking to you uncivilly or with an inappropriate tone, ask yourself whether that person is really crossing reasonable and legitimate boundaries you have set in how you want to be treated, or whether you are trying to police their tone at the expense of their message. If someone is bullying you, then insist that that behavior stop before you will move forward. That’s boundary setting. That’s insisting on being treated with respect. But if the person is merely dressing you down (especially if you deserve it) without being inappropriate, or if a service provider is merely not being as warm or friendly as you might prefer but is still acting within the bounds of basic civility, then consider just moving past your discomfort and focusing on the larger issue. 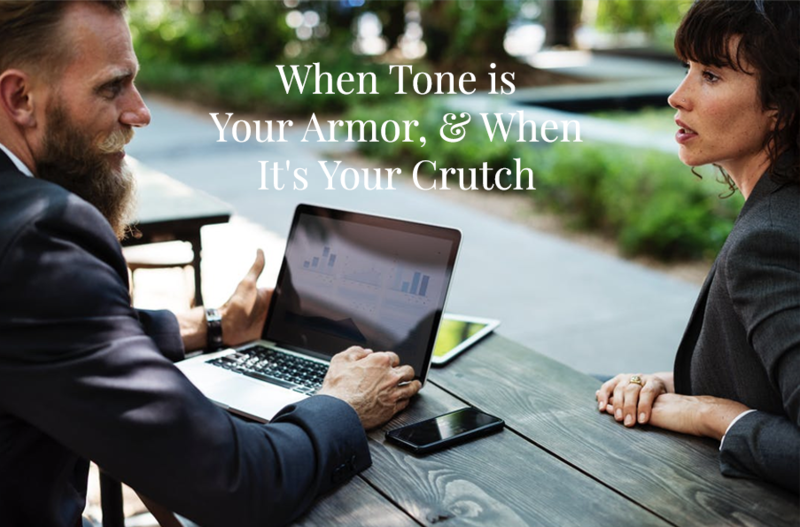 When you refuse to put up with bullying, or when you personally make an effort to be considerate and tactful, then you are using tone as your armor – by protecting yourself as you did in the first scenario, and in the second by protecting your message. But if you derail conversations away from the message entirely, then you may be using the concepts of “tone” and “civility” as a crutch, as a way of not addressing your own entitlement. And if you’re doing so from a position of power, then you are silencing others while doing so. Being strong is about protecting yourself, but it’s also about being flexible enough to accommodate others, within reason. Radical honesty, asking yourself hard questions about the reality of the situation, is difficult – but necessary. Remember, the answer to any question might well be a “yes,” so the beauty is that many times, the answer to those questions will actually reaffirm your original course of action, which only makes your stronger! And in situations where that reconsideration leads to changing your course… well, that also makes you stronger because of the important lessons learned and personal growth. If you enjoyed reading this post, please recommend and share to help others find it!